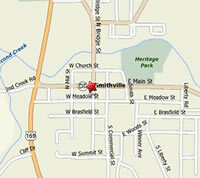 The Smithville Court House, located in beautiful downtown Smithville, is an easy court to navigate and deal. Smithville generally will amend speeding tickets to defective equipment. A defective equipment is a non-moving violation and will not be reported to the Department of Revenue. Most speeding tickets do not require a court appearance unless you were caught speeding over 25 miles over the speed limit. A defective equipment will cost you between $175.00 and $225.00. The Smithville attorney fee is generally lower because they are “mail in” tickets.